CT2110-1 an 83% tungsten carbide/17% cobalt coating applied using the plasma spray process. 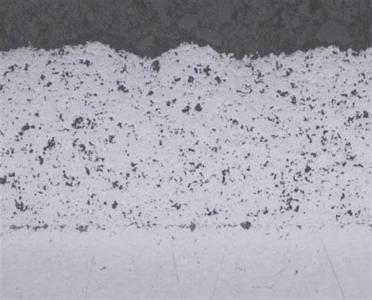 It is very hard, dense, tough coating exhibiting high bond strength, excellent fret wear resistance, good abrasive wear resistance, good impact wear resistance and can be finished to a very fine finish. This coating is slightly more ductile than 88/12 Tungsten Carbide Cobalt. CT2110-1 is used in applications such as aircraft blade mid span dampers, aircraft flap tracks, wire drawing blocks, oil field sucker rods, and labyrinth seal teeth. Finish CT2110-1 by grinding with diamond wheels. CT2110-1 should be wet ground. CTS can recommend grinding parameters if needed.